May 20th was sean and I's 2 year aniversary. These 2 years have been crazy. So much has happened that it feels like, 2 years... thats all! 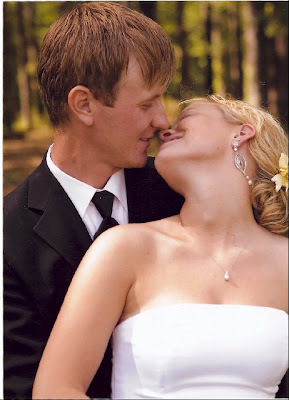 Two years ago, on May 25th, we ended our honeymoon with the news that my brother, who i love so much, had passed away. Ryan was my older brother and though physically he could have never protected me, I always felt taken care of by him. I know that sounds strange because he needed so much care. I always new that he loved his baby sister so much. And I loved being his baby sister. Its nice not to have horror stories about him, like being pinned down and getting a loogie spat in my mouth, or waking up to a fart in my face, or being bitten in my arm with teeth marks to prove it, thanks Kris! Although I do recall one time making Ryan really mad, he chased me around in his wheelchair and actually pinned me into the corner! Ha! Ryan and I were at home alone together a lot. He watched me and i took care of him whenever mom ran to Prevo's (the local grocery store, no joke, my mom went there every day!). I think we ended up sitting around and entertaining each other. I was a skinny little thing that could never hold my self together, i was always called a wet noodle. Ryan would tell really corny jokes, just like my dad. But, they always made me laugh, I would do this sloppy, laughy dance thing that would him laugh. There was a lot of laughter between me and Ryan in our years on Cherry Road. To say the least, it was heart wrenching to lose him. I miss him very much. Since then, there have been so many ups and so many downs. Sean and I got shoved into reality asap. The "honeymoon phase" wasn't all bliss for us. Things aren't horrible now, but the move to Texas has been so difficult. Losing the baby was and still is so hard. Looking back is good. I told Sean that for the hell that we have been through... I would rather go through hell any day with him, than have a perfect life without him. I can't begin to tell you how much I love him. I still can't believe I get to spend the rest of my life with him! Lover, you are my love. Thank you for being who you are. My heart is at home with you, I have never felt so safe. I love you so much. Ry, I miss you. Sean can't explain Star Wars to me nearly as well as you could, so I've just given up listening to him. We did watch Braveheart the other night. It made me miss you even more. Everyone else, Its good to talk a little about Ryan. Its hard living in a place where no one knew him. Thanks for listening. hey girl. glad to listen. that was a very sweet post and I'm glad you wrote it. love you and miss you! Great post, Katie. So sweet! I'm glad you posted again. Happy Anniversary! And thanks for posting...I always love hearing what you have to say...and hearing you talk about your love for you brother and your husband is so wonderful. Love you! i miss your face. it really makes me happy to know you are so happily married and so in love. i feel privileged to have known Ryan. you should call me or i should call you... or maybe a combo. Such a sweet post! So glad you were able to share your thoughts with all of us out here in blog land. Such precious words remembering your brother, and dear dear words honoring your hubby! I miss Ryan...and I miss you Kates. Keep posting cause I love to get a little glimpse into your world down there in Texas.Praying for you guys. Hugs to you and Sean. Thank you sweetheart for the post. Katie, thank you for sharing about Ryan. Kris and I had a good laugh and it is so good for the soul to reminisce. We miss him, too! I am so thankful you posted Katie. Your words are sweet and meaningful. You were a great sister to Ryan. I miss you and your family. Thanks for sharing your memories. love you. Beautiful Kate! I love your stories of Ryan. Mark and I are so glad we can call you close friends. Please know that we love you and miss you--praise God for bringing you and sean together and for another year to grow in unity! Katie, your words are so genuine and loving. I am glad you could share memories of Ryan even though it may be hard! As for you and Sean. I am very happy that God has brought you two together! You two are perfect for each other!!! Katie, Don and I have been thinking of Ryan and your family. Your post gave us a wonderful glimpse of him. I hope you'll share more memories of him from your growing up days. Hope and pray that you and Sean are doing well. We miss you here! 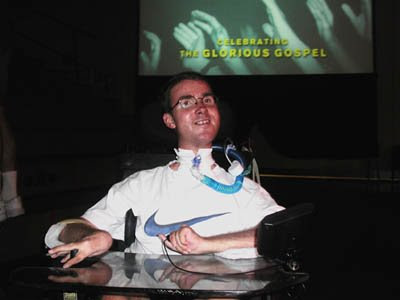 I think about Ryan every Sunday when you're family sits in front of us at church. I remember his face during worship... I don't remember if he could sing, but you could tell he was worshipping. There's something special about making it through so many 'valleys' as a young married couple. You and Sean seem to have such a grace and maturity that takes most couples a lifetime to reach. I pray that the Lord will heal your heart from the sadness. Love you friend.